Opponents are quick to learn that defeating Colorado's Amy Williams is as tough as scaling the state's imposing Rocky Mountains. Williams has been well-trained in technical wrestling...but she's quick to abandon that training when questionable tactics can more easily get her to her goal. Translation: this lady will cheat to win! And there's no telling what will happen when her creepy alter-ego, Cemetery Baby, comes to the ring! Amy locks-up with her opponent at the start of this match. Amy's alter-ego: the very creepy Cemetery Baby. Boot to the throat: clearly not a legal tactic! Obviously, Ms. Williams does not get along well with the ringside fans. How It Started: I started watching wrestling during the Attitude Era and just got hooked on it. I've always been a fan of full contact sports and this is definitely the ultimate! After deciding to take time off from school I began training and I'm loving every minute of this! Gimmick: I'm a girl that will definitely use some "questionable" tactics to gain any advantage I can get. When I wrestle other girls the fans really don't seem to like it, but when I'm in the ring against guys they don't seem to mind quite as much. I might be a little over-confident and dirty...but so what? I've got also got a strong technical background at my disposal so, man or woman, you'd better watch out! I also have an alter ego I like to call Cemetery Baby. She's a member of a stable called The Freek Show and also the personal manager of Violent Ed. Wrestling Style: One of the things I pride myself on is my technical background. If I can keep things on the mat then I will. I'm definitely not a high-flyer! I'm not afraid to cheat a little to get on top, though. Gear: It varies depending on my mood. I'll usually wear black flare leg pants with a corset or halter top, but I'm starting to branch out. My newest outfit is a pair of altered bell bottom jeans with a halter or tank top. 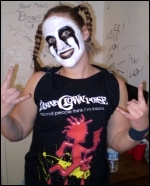 As Cemetery Baby, I wear torn jeans with fish net tights underneath and an ICP logo shirt. Biggest Win: My biggest win was in my second match when I was able to beat a girl who had pinned me the show before with a sunset flip. That's why I don't go for that high-flying stuff...she missed her moonsault, I hit a neckbreaker. The end. Worst Loss: My first match wrestling for Primos was my biggest loss. It was in front of a 300+ crowd and the girl beat me with my own submission! Favorite Type of Match: I'd rather be in a singles match since you don't have to rely on anyone but yourself. When you win, it's your victory and no one else's. Then again, if you lose there's also no one else to blame. Favorite Moves/Holds: Arm-trap neckbreaker; spinning heel kick; Boston crab; fisherman suplex. Finisher: "The Perfect Ending" ...a snap DDT. Biggest Allies: Bronx; Joey Terrofying; Violent Ed. Favorite Wrestlers: Triple H; Shawn Michaels; Lita; Trish Stratus; Mickie James. Wrestling Ambition: Of course I would love to make it to TNA or the WWE one day, but for the time being I'm having the time of my life perfecting my skills on the indy circuit. I've played hockey since I was about 11 years old and continue to do so to this day.....I know my way around a car. I've studied automotive for four years and can fix just about anything!.....Right now I'm taking time off from pursuing my degree in marketing.